The key to catching salmon on the fly is that you don't react to these initial nudges on the fly reel. This can be particularly hard to do if you've come from a trout fishing background and are fully trained to immediately set the hook. In 99% of cases a salmon needs enough time to turn on the fly before the time it right to let the fish know who really owns the fly! With the above in mind it's crucial you have the composure to wait until you're at least several seconds into the take before setting the hook. You must wait for the steady draw of fly line off your reel before simply clamping the face of the fly reel with the rod tip pointing down. This logical procedure allows the salmon's own bodyweight and forward momentum to properly squeeze the hook home for you. Logic will also tell you that the above hooking method will be far more effective than the normal lift into the fish approach which engages the soft action of the fly rod & lightly set reel clutch which exerts little pressure on the hook point. 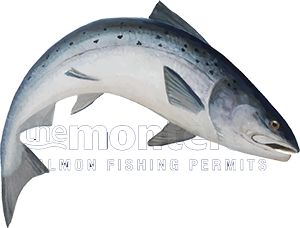 If you don't set the hook properly a salmon will usually demonstrate how good it is at getting rid of an unwanted object from its mouth and will usually demonstrate that within the first 60 seconds of contact. Wait until you're over the initial tugs stage and are well into the steady draw of line part of the take and keeping the fly rod tip down clamp the fly reel face until you feel the weight of the fish for a few seconds. This way you'll know beyond doubt that your fish is hooked properly and at that point you can relax into the fight knowing that the fish has been properly hooked and escape is highly unlikely. I know I've repeated this effective salmon hook set procedure twice which is just my style of brainwashing!